Where Faith, Ministry and Tradition come together. Faith. As part of the modern-day Jesus movement, we believe in the radical love of God and God’s presence on earth in Jesus Christ. We understand Faith begins with a question, not an answer. Ministry. We believe in loving your neighbor and that God calls us to serve others — whether that be through a nursery school, an affordable living community, or something we haven’t even imagined yet. Tradition. Our worship has ancient roots and we believe some things are worth preserving. Music, liturgy, art, prayer, and meditation — all of these powerful tools serve to bring us closer to God. It’s hard to ignore God’s presence when you’re surrounded by beauty. Located in the historic village of Terrace Park, St. Thomas has been serving the Greater Cincinnati community since 1876. St. Thomas is home to many exquisite stained-glass windows, several choirs, and even an orchestra. The Episcopal Church is also incredibly fortunate in that our worship derives from some incredibly profound and ancient liturgy – found in the Book of Common Prayer. 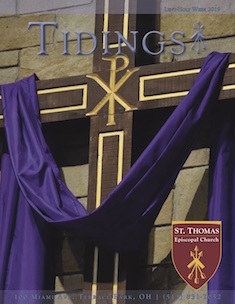 Founded as a Mission in 1876, St. Thomas has been the village church for over a century. Today, we improve lives all over Cincinnati. Drawing on Scripture, Reason, and Tradition, we believe that Jesus compels us to welcome ALL to the Lord’s table.